In this article, we will take a look at the best safety razor blades. Double edge safety razor blades are not designed equally as our review will show. They each have their distinguishing features. Some will work best with a certain type of razor or are best for beginners. Some are better if you have sensitive skin. If you use a dull blade, do not expect jaw-dropping results. It is, as they say, garbage in, garbage out. The shaving industry presents us with several types of razors. These shavers include cutthroat razors, disposable, cartridge, electric shavers, and safety razors. Each of these has their fair share and pros and cons. On face value, we could say that safety razors are like the middle of the road; safe but nothing special. But upon taking a closer look we can quickly note the strengths of this razor type. There is more to safety razors than meets the eyes. Do not make the mistake of shrugging them off like any other razor type less than the macho “cut throat” straight blade. They are great and are a major upgrade from disposable razors. It is a perfect entry into the world of wet shaving. Some of them give straight razors a run for their money with regards to delivering high quality and close shaves. That said, it should be pointed out that like other razors, double-edge safety razors are only as good in performance as the blade used. When you throw in a dull blade, do not expect jaw-dropping results. It is, as they say, garbage in, garbage out. Safety razor blades are not designed equally. They each have their distinguishing features. Some will work best with a certain type of safety razor or are best for beginners. Our Editors’ choice Feather Double Edge Blade might not be the best pick for a beginner, but if you want the sharpest blade available – that’s the one to get. The guide to finding the best safety razor blades below shows this all very clearly. Choosing the best double edge razor blade that fits your needs should be a top priority as this is certainly the business end of the shaving process. But understandably, this is easier said than done. To make the decision-making process a tad easier for you below is some information to act as your guide. Spend your time learning about blades, and it will pay off in the end. 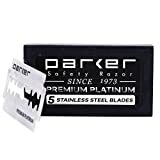 With that said, let us kick this review and buying guide of the best razor blades off with considerations to make when purchasing one to fit your personal needs and preference. You probably are eager to sink your teeth into the reviews. To know which blade is the best, purchase and get shaving. This is expected. But rather than giving in to your desire, please take some time to learn what makes a great safety razor blade. Know why we chose the blades on this list. A good understanding of these seemingly simple items is a big step towards becoming a pro. As we go through these factors, bear in mind that one man’s meat is another man’s poison. A blade great for your friend may not be great for you. Skin sensitivity varies as do the texture of whiskers. So do not pick a brand that your friend claims to experience success with. Seek to understand yourself and the qualities of the blade. Here are a few things to give some thought. Most men and some women assume that the sharper the blade, the closer the shave they get. Well, this is a classic half-truth. What this assumption forgets is that sharp razors also predispose the user to a higher risk of making cuts and nicks on the skin. This is especially if you are still getting the hang of your shaving technique. It is, however, true that a sharp blade will allow you to make fewer passes during a shave. Aside from sharpness, you also need to consider the smoothness of the blade. Smoothness, in this case, refers to the blade’s cutting angle. Smooth blades do not have extreme cutting angles. As such, they require the user to apply some pressure while shaving in comparison to sharper blades. With smooth blades, there are reduced chances of cuts and nicks. On the flip side of the coin, smooth blades do increase the chances of experiencing skin irritations which may be a problem for those individuals with sensitive skin. Yes, the kind of hair you sport matters and has a bearing on the type of blade you should choose for your safety razor. While there are men who have similar hair (after all, there are a finite number of hair types), they are all slightly different. Also, as earlier mentioned, what works for your colleague may not necessarily work for you. On the bright side, safety razor blades are available in a variety of choices. You can pick any that suits your hair type. Generally, coarse hair requires aggressive blades. The term ‘aggressive’ in this context refers to the sharpness of the blade. Dull blades will have a hard time cutting through coarse hair. And even when they manage to, you will experience some tugging, pulling and pain in the process. In addition to the coarseness of your hair, you need to consider its length. Long hair requires aggressive blades. With all that said, if you have sensitive, rough or acne-prone skin, you should consider getting a less aggressive and smooth blade. You cannot risk irritating your skin. Here is the beauty of using safety razors. Beginners can learn to use a safety razor to obtain a close shave fast and with great ease. The learning curve is not as steep as with straight razors. It does, however, need some practice especially if you are advancing from cartridge razors. As a beginner, it is best you start out with mild blades. These will allow you the leeway to experiment and get the hang of the shaving technique without leading to cuts and nicks. Depending on your safety razor and blade, you will need time to adjust and learn the right amount of pressure to apply to yield the best results with minimal irritation to your skin. Most men prefer sticking to brands that have been tried and tested. While this is the safest move for many, it does no harm in trying out different blades. Actually, this is the only way you get to learn what really works best for you. Safety razor blades can also be bought in variety packs . These packs allow you to save some cash and still experiment and discover which brand suits you best. This blade is proudly presented to you by a Japanese company that has over the years built for itself a rock-solid reputation. The sharpness of this blade is unmatched. And even better, this blade is designed to fit on any safety razor (double-edged) on the market. Now it is true that Feather is not exactly a household name like Schick and Gillette, but all the same, its products are designed and manufactured to rival those of these top rated brands and companies. Feather, the company, and brand has been operational since 1932. However, it was only in 1964 that they decided to take their production of safety razor blades to the next level with the introduction of replaceable stainless steel blades. It is worth pointing out that Feather is also in the business of producing medical equipment including surgical blades, safety razors like the very popular Feather AS-D2, straight razors such as the Feather Artist Club SS and Feather Artist Club DX. And we all know how sharp these blades are. The same technology they use in the manufacture of surgical blades is used on their shaving blades. This goes to show how sharp these safety razor blades are. Now, while the sharpness of this blade is rivaled by a few other brands on the market, it is said to be perfect for beginners. Shocking right? However, caution should be exercised. Experts advise newbies to use lightweight safety razors or if they prefer the heavier kind, they should be keen not to apply too much pressure on the skin. This will help to avoid nicks and cuts even as they hone their shaving skills and techniques. Extra care has to be taken especially in the hard to reach areas as well as along the jawline where the skin is firm. Every Feather blade is coated with platinum and is durable. The blades are sealed in a special piece of paper (coated). This helps to prevent you from accidentally cutting yourself and also prolonging the blade’s lifespan. The sharpness of this blade will ensure you have a smooth shave. Most reviewers who started out will dull blades (the kind taunted to be newbie friendly), were shocked at the effectiveness of the Feather blade. The closeness of the shave achieved is impressive even for shaving pros. Suitable for all safety razors like Merkur, Muhle, Parker, Feather, and Edwin Jagger. 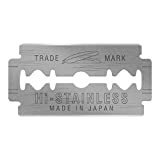 These Japanese blades are the sharpest on the market but do not cost more than other double-edge razor blades. Feather is not only a brand that has created a name for itself. It is also a brand name synonymous with high-end quality. The sharpness of the Feather DE blade is impressive. The blade is a must-have for every man. It is the best safety razor blades for sensitive skin. I think they are worth a recommendation! This Derby razor blade is made in Turkey (not Sweden as claimed on Amazon and some other review sites). The blade is ground and then hardened. During its creation, platinum, chromium ceramic and tungsten are added to the material. The resulting blade is not only durable but strong. This manufacturing technique is referred to as sputtering. It involves the use of high energy particles to coat the blade with a thin film of other materials. Added last is Teflon. Teflon works to reduce the friction between thick facial hair and the blade. With this blade, you are assured of getting a close and comfortable shave. You do not need to worry even when you have sensitive skin. Speaking of sensitive skin, Derby blades are great for those working on sensitive skin. And the beauty of using Derby blades is the fact that they are all extremely uniform. Just like eating a Big Mac, no surprises from one to the next. Make no mistake of thinking that Derby is a newcomer to the industry. If anything, it has been around for a while and has built up a solid reputation. Azmüsebat Steel Industry and Trade Corporation (the original name and mother-company) was founded in 1940. The Double-Edged blade can fit on virtually any double-edged razor on the market. But even better, the blades feature a thin web between the two blades. This web allows you to break the two blades to form two single-edged blades for use on single-edged razors. Last but not least, the Derby blades are well priced and are worth every penny invested in them. Suitable for all double edge safety razors. You can count on the Derby brand to provide you with high-quality blades that will make your daily grooming process a less tedious process. This is in my opinion the best safety razor blades for beginner(s). The way I see it, high-quality blades are nothing more than high quality if they have to be replaced every few days after use. Most often than not (too many times than most experts would like to admit), quality is wrapped in aggravation. Luckily, this is not the case with this Astra blade. This blade is not only at the top of many best safety razor reviews, but it also is durable. The Astra Platinum will always provide ten shaves at the very least. 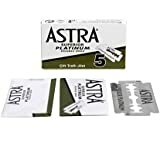 While the thickness of the facial hair has some bearing as to how long a blade lasts, in the world of safety razor blades, it proves quite challenging to conquer the stamina the Astra Platinum bears. Before 1996, when the company was bought by Gillette and production moved to Russia, these blades were manufactured in the Czech Republic. Since this buy, Astra blades have been manufactured in Russia. Given their top rating, they have been subject to lots of reviews on online e-commerce sites including Amazon. They have maintained a near-perfect 5-star rating. Needless to say, Gillette is doing something right with these. Below are some of the areas where the company is hitting a home run with the blade. The Astra Platinum is by far one of the sharpest blades available on the market. As mentioned above, they are designed to last for a long time. Some of its previous consumers have gone on record to praise its sharpness and durability. They state that the blade can retain its sharpness for up to the 7th shave. This is better than what most blades can promise. In comparison to numerous double-edged blades on the market, the Astra Platinum trumps them all in smoothness. Do not let that make you forget what you are shaving with. This blade is sharp and using it, you run the risk of cutting and nicking yourself. But in all fairness, the same risk is available on all sharp blades. Nonetheless, this blade is marketed to provide clean shaves while causing minimal irritation in comparison to blades in its category. Some pros even argue that this is one of the best blades available for shaving sensitive skin. With all that it has going for itself, the Astra Platinum is expected to be worth a fortune. But surprisingly, it is relatively inexpensive for the features it sports; its high quality and durability. When purchasing the 100-pack, the cost for each blade is estimated to be about a dime. So yes, this is the best blade money can buy. The Astra Platinum gets lots of praise and rightfully so. It is great and delivers as it is marketed. Also, you do not have to break the bank to get one of these – they are affordable. Suitable for all double-edge safety razors. Gillette is the go-to brand for many professionals in the shaving industry. Being a newcomer, you might be wondering why this is so. What has Gillette got that other brand’s lack? Is the brand as good as it is touted to be or does it fall short of the hype? To say the least, Gillette delivers on every promise it makes, especially when it comes to its blades. The Gillette 7 o’clock blade is no exception. At this point, it is worth pointing out that Gillette holds several patents to the double edge safety razors. Gillette is the leading safety razor brand – everyone knows about it. And unlike some other brands, the company produces products with impressive quality. With the 7 o’clock blade, what is there not to like? Like all other Gillette blades, its life starts in Russia. In comparison to other blades on the market, the Gillette 7 o’clock is not as sharp. However, the double-edged blade provides a close and baby smooth shave. It is sharp enough for you to apply slight pressure on the head and get impressive results. It is true that this blade is not the longest lasting on this list. Nonetheless, it provides about five shaves before it gets too dull to achieve a close shave. If your hair is not too coarse, you might get a week of shaving with this blade. Last but not least, this blade is affordable. You will only spend a few cents purchasing this unit. Full disclosure – it should be noted that some 7 o’clock blades are also manufactured in India. This variation in place of manufacture has caused some confusion in professionals. There are those who are firm in their belief that the place of manufacture makes a great difference in the level of quality the blade features. Most shavers prefer the ones manufactured in Russia. But here is the thing. All blades regardless of their place of manufacture all come in green boxes. However, the ones from Russia are labeled Super Stainless (Russia), and those from India are labeled Permasharp Stainless Blade (India) on the boxes. Additionally, there are blades from India that come in black boxes and others from Russia that comes in Yellow boxes. These blades are known as Super Platinum and Sharp edge respectively. But just so that we are on the same page, in this review, we are referring to those blades from Russia that come in a green box. At the end of the day, whether the blades are from India or Russia, what matters I that they are of high quality and perform as described. This blade adds to Gillette’s long list of successful products. These blades are top grossing and preferred by many. They offer a comfortable and clean shave with minimal irritation. Suitable for all double edge safety razors, though I wouldn’t use them with a Feather AS-D2, that is like driving with the hand-break permanently on with your Ferrari. Just like Gillette and other top safety razor blade brands, Merkur has built a name for itself over the years. They created a tradition of top quality and stuck with it for generations. The company is located in Germany and was started by Emil Hermes. Believe it or not, the company did not start out as one manufacturing shaving products. They grew into this over the years. And boy did they hone their design and manufacturing skills. Today, as pointed above, they are the top in the industry, with products like the bestselling Merkur 34c HD, the adjustable Futur, high-end straight razors like the Dovo Inox and top-notch shaving brushes as well. This double-edged razor blade is one of Merkur superior products. It is made from stainless steel and coated in platinum. Each blade presented to the market by this company meets all the industry standards and specifications. Additionally, this particular blade boasts of achieving a clean and close shave. But wait. What has the platinum coating got to do with anything? Well, in this case, it helps the blades to remain sharp and free of imperfections even with constant use. The stainless steel used to make the blades help protect them from rust. With regards to price, this blade falls right in the middle. It is not cheap, and neither is it too expensive. For the quality they provide, the price is a bargain. Given the sharpness of the blades, it goes without saying, they may be too aggressive for newbies. But the beauty is that they do not take long to adjust to. The blades are comfortable to use and provide a smooth shave each time. Admittedly, the word sword in the name of this blade does not exactly instill confidence in its smoothness and ability to provide nick-free shaves. However, the team of experts behind the manufacture of this blade has done a really great job. Wilkinson coats the blade through a 3-step coating process. The layers help to reduce irritations to very low levels. The blade is smooth enough to be considered perfect for beginners in the game. The three-step coating process includes chromium, ceramic and PTFE. These materials are designed to prevent corrosion, increase durability and reduce irritation respectively. The company claims that their blades last longer than blades made from stainless steel. Using this blade, you get about six close shaves. Wilkinson is a brand that has been in the industry for quite some time. It was first created in 1772. Back then it was a company dedicated to the manufacture of daggers, knives, and swords (now you know where the term “Sword”came from). The company first created a razor blade close to 2 centuries later. Currently, the Wilkinson blades are made in Germany. When Polsilver Super Iridium first hit the market, shavers could not stop raving about how perfect and efficient they were. Unfortunately, after a while, they were taken off the shelves. After some time and having changed distributors, these blades are now back on the market. And believe it or not, they are still getting the same love (if not better), that they were before. These blades are mostly made in Russia with others coming from the Czech Republic and Poland. While slightly more costly than most blades on this list, they are awesome. Their quality and results do not disappoint one bit. These Iridium blades are designed with a perfect balance between smooth and sharp. Their sharpness will cut through thick hair with ease without pulling or tugging. They have an iridium coating. Now, iridium is a hard metal in the same category of metals like platinum providing great durability. They are not designed to be as sharp as the Merkur blade on this list. They are, however, more durable than most blades that boast about sharpness. While these blades are not as popular as the rest of the blades on this list (probably due to their disappearing acts), they do give them a run for their money in some aspects. Suitable for all de safety razors. While the process is simple, it should be treated with the attention that it deserves. If you have just crossed over from using disposable blades, you will find classic safety razors quite tedious and a challenge with all the changing needed. However, once you get used to the process, you will wonder why you did not cross over sooner. Before anything else, you should consider the safety razor type you use. Is it a single piece, a two-piece or a three-piece safety razor? Is it a Twist-to-Open safety razor? Next, you will need to consider how your blades are packed. Some are individually wrapped while others are unwrapped. The wrapped types of blades are divided into two major categories. Some have a single wrapper while other feature double wrapper. Some wrappers have a small adhesive dot sticking to the blade. To retrieve the blade, hold it by the end and pull. This step is for the two and three-piece safety razors. The process of dismantling the razor often requires you to unscrew the handle. Set the different parts safely to the side before handling the blade. If your razor is a twist to open type, you will need to do exactly that – twist the handle to open the head of your razor. This step involves mounting the blade on the razor’s cap. If yours is a three-piece razor, you will need a mounting plate. Ensure the razor’s mounting plate is positioned properly. If you have it upside down, you will experience problems shaving. The last step is to replace the top and screw it in place. Once the top is in place, it is time to replace the handle. Do this while holding the razor head and blade in place. As you screw, you will notice the pieces getting close together and the blade taking a 30-degree arch. And with that, you now know the steps to becoming a pro blade replacer. As with all other reviews, our process of putting together this list involved a lot of research coupled with objectivity. But since we do not have a lot of resources at our disposal to test each blade available in stores, we rely on customer reviews and personal experience. While there are other double-edge blades that might have been great for this list, we believe that the seven above listed will not disappoint. We have looked at safety razor blades for those who need a razor for sensitive skin, coarse beard and also the price. They have a perfect combination of quality and value. As we bring this to an end, we encourage you to share your experiences and opinions with us. Have you used any of our best safety razor blades listed above? If so, what are your thoughts? Which brand did we leave out that you strongly feel should have been represented?